Communication processes are constitutive elements of innovation. To fully exploit the given potential and thereby remain competitive, companies must generate innovations. Therefore, innovation management is a crucial factor for a company’s sustainability – and professional corporate communication is a major force in this process. Innovations are conceived as ideas (for products, services or procedures) which are examined several times in an innovation process, then developed, tested and finally produced and introduced onto the respective market. 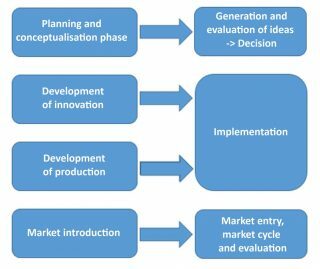 Internal and external communication processes as constitutive elements of innovation must be involved in all sub-processes of innovation management. Only then will a certain new course of action be successful. Yet, how does that work in practice? Prof. Nelke and her team analyse your company’s innovation efforts and develop a plan with you to implement communication at all stages of innovation management and to use it to ensure successful processes in the future. The phases analysing, planning, execution and evaluation represent the sub-processes. In the next step, the tools identified as the most relevant are implemented in the company’s day-to-day operations. Subsequently, the employees participate in workshops where they learn about the importance of communication for innovation processes and are acquainted with the predetermined tools. Professional innovation management also works out to the benefit of a strong employer brand. For this reason a distinctive innovation culture in combination with a transparent style of information and communication is a point in employer branding. This „pivot“ between corporate communication and personnel management supports the company in its aim to retain skilled employees and attract new talent.